One question which I’ve been asked a few times is how trading commissions affect RESP contributions and grants. I am from Montreal, I read your book (great!) and I opened a family RESP last month with Questrade for my son (age: 1). My intention is to use Ishares ETF (XWD @ 70% and XIC @ 30%) because he is young and I am able to take some risks. I initially wanted to go with TD E-serie (following your advice) but it was not possible to get the QESI (Québec Education Savings Incentive) thru them. In this particular case I think the best option is Questrade. My question: How commissions are considered in the RESP. Are they deducted from the contribution and the net contribution is considerated for CESG and QESI calculations OR the contribution is the gross amount even if a part of the deposit is deducted to pay trades ? For example, if every year I put $2509,90 in the RESP account ($2500 in contributions plus $9,90 for the cost of 2 trades), what will be the amount of my contribution thru the Government for these years: $2500 or $2509,90. For one year, there is not a big difference but after many years, a misunderstanding of this rule can make a big difference. Trading commissions are not relevant when calculating RESP contribution amounts and grants. 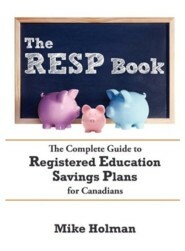 Any money that is moved from a non-RESP account to an RESP account is considered a contribution. Once the money is inside the RESP account, it doesn’t matter what happens with that money – commissions or no commissions. For example, if you move $1000 from your bank account to your RESP account – you have made a $1,000 contribution and will receive the appropriate amount of RESP grants. If you take that $1,000, buy $900 worth of ETFs and pay $10 in commissions, the RESP contribution is unaffected. It is still a $1,000 contribution. In your example – someone who has $2,500 of grant-eligible contribution room and contributes $2,509.90 will only get the grant calculated on $2,500. The extra $9.90 will not be eligible for a grant. I don’t recommend contributing money to an RESP if no grant will be received. That excess money should go into a TFSA instead. FYI – The same logic applies to TFSA and RRSP accounts. Money moved into the account is a contribution. Any fees paid on transactions inside the account do not affect the contribution amount. One other thing – when calculating trading commissions at Questrade, you must include ECN fees. For securities that trade at $1 or more – the fee is $0.0037 per share. It’s $0.0009 for stocks with share value less than $1. This is an extra charge. In Phil’s case, he might end up buying 73 shares of XWD and 34 shares of XIC which will result in ECN fees of $0.27 and $0.13 respectively, which is added to the base fee of $4.95 per trade. The total commissions for those two trades will be $10.30, not $9.90 as he indicated in his example. 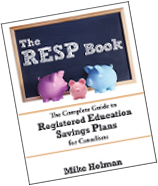 The RESP Book – The simple guide to RESPs. I feel for your reader Phil: the TD e-Series are great mutual funds but TD’s refusal to participate in QESI is disappointing. I ended up switching to RBC Mutual Funds because (among other reasons) they participate in QESI (not RBC Direct though) and their index funds have a MER competitive with TD’s. Something else to look-out for with discount brokerages is whether they charge an annual fee for accounts below a certain value (another reason I didn’t go with RBC Direct). Makes sense, a contribution is made when deposited into the account (RESP, TFSA, RRSP). What you do with it once it’s in there is your business. TD now supports QESI ! @schultzter TD does offer the QESI, but not for the e-series funds. You’re right that RBC has some good index funds. The annual fees is critical for RESPs – most RESP accounts will take a long time to get to a level where they are not levied. @Echo – You need to decorate your new house with my new book. 🙂 I’d be happy to provide a review copy. When I was talking about TD E-Serie I wanted to say TD E-serie throught TD Canada trust, not trought their discount brokage firm, TD Waterhouse. With TD Waterhouse you can get the QESI but you have to pay $50,00 in annual fee until you will have $25 000 in the RESP account. Also each trade is $29,00 ($9,95 per trade if you have $50 000 at TDW in family assets). Depending how much you put at first in the RESP account and at which level is your family assets with TDW, it can be interesting to go with them but if you make small contribution every year, commissions and administratives fees can represent a sigificative percentage of the annual contribution. I know I’ve commented on this before but I can’t see the appeal of the E-series funds from TD. 1000 dollars invested between 2005-2010 in the TD U.S. Index which uses the S&P 500 as a benchmark would have returned a total of $939.16. The S&P itself would have returned $1174.67. Yes it has low costs, but is this all attributable to tracking error? Sorry I should have mentioned that was the Canadian dollar U.S index. The U.S dollar index performs much better. That would seem to say that the U.S dollar denominated fund seriously outperforms the Canadian dollar equivalent. @Chris – I think the performance depends on the perspective. If you translate the US dollar denominated returns back into Canadian dollars – they should match the fund that is in Canadian dollars. Previous post: Different Types Of Canadian Financial Advisors – Which Is Right For You?